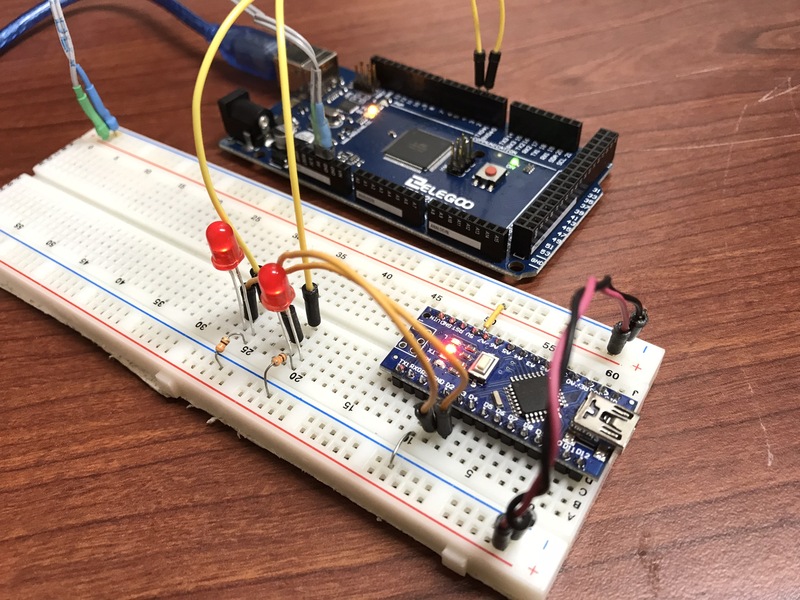 Ever wanted to measure the frequency of a square wave using an Arduino? There are a couple of good solutions out of there to do this, but not all of them had the capacity to do multiple inputs. I couldn’t find this quickly so here is my solution. Here’s the link to the code if you want to skip ahead. The code uses interrupts and doesn’t use any kind of delaying so it’s good for giant state-machine applications. My application for this is measuring signals from 10Hz-100Hz in which this can measure within 1% error. The absolute limits of the code are 1Hz-50KHz. This project is on GitHub if you want to send a pull request to make improvements. 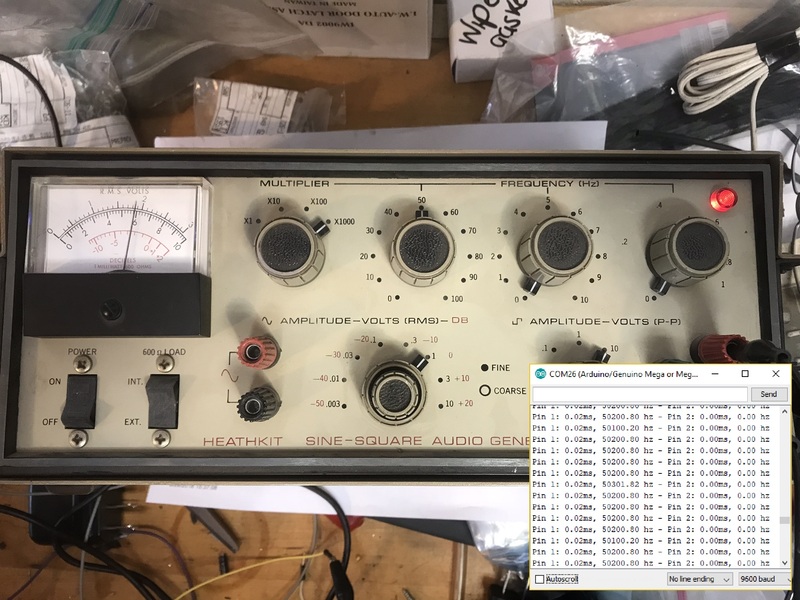 For testing, I wrote a simple function generator and uploaded it to a separate arduino. It outputs a pulse train with periods of 10ms (100Hz) and 5ms (200Hz) on pins 2 and 3. I attached LEDs and their resistors for debugging. Pins 2 and 3 on the function generator to pins 2 and 3 on the frequency counter. This code will work fine in a stateless application, because there are no delay statements (which some other frequency counters I’ve seen online use). It’s a little bit complicated, send me a pull request if you can refactor it to be cleaner. * - The important data is stored in `period_averages_ms` and `frequency_averages_hz`. You address them using the indices defined at the top of the file. These arrays get updated each time `compute_counts()` is called. Keep it `compute_counts()` somewhere in the main() loop. * - It uses [interrupts](https://playground.arduino.cc/Code/Interrupts) which might not be right for your proejct, but normally shouldn't get in the way of too much stuff. * - If the ISR hasn't seen a new edge in 1000000us, both `period_averages_ms[p_index]` and `frequency_averages_hz[p_index]` will be set to zero! * - This means that slowest frequency that this code can detect is 1hz! attachInterrupt(digitalPinToInterrupt(freq_pin_1), new_freq1_edge, RISING); // you could change this mode to whatever you were looking for, FALLING, CHANGE etc. // computes the average of the buffer for a given signal. Must be called before using the period_averages_ms or frequency_averages_hz buffers. The important data is stored in period_averages_ms and frequency_averages_hz. You address them using the indices defined at the top of the file. Make sure you call compute_counts() before using this data. Keep it somewhere in main(). It uses interrupts which might not be right for your proejct, but normally shouldn’t get in the way of too much stuff. If the ISR hasn’t seen a new edge in 1000000us, both period_averages_ms[p_index] and frequency_averages_hz[p_index] will be set to zero! This means that slowest frequency that this code can detect is 1Hz! If you have any questions on how to add more signals, leave a comment! That’s like less than 1% error! Pretty good! 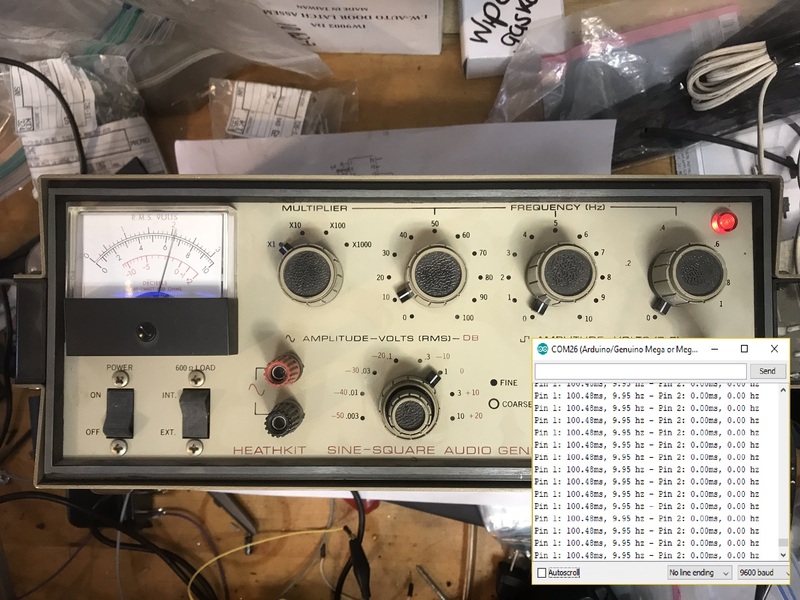 I also tested the code with a real function generator. Things worked really well until around 50KHz, so I would say that this code can’t be trusted past 50KHz.